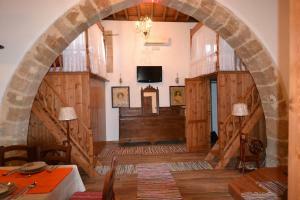 We really enjoyed in your lovely Patitiri Villa and the location in the center of Archengalos. We came on Easter week. 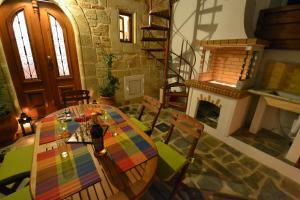 The villa is located near the main church so we really felt the heartbeat of a true, authentic and untouristic village. It was also a great starting point for our day trips in the island. Traditional style property but beautifully modernised to a high standard. Plenty of space for the three adults in our group. Ideal location to explore the island without staying in a commercialised tourist area. Good restaurant nearby serving local dishes. Excellent wifi and even a bottle of wine in the fridge. 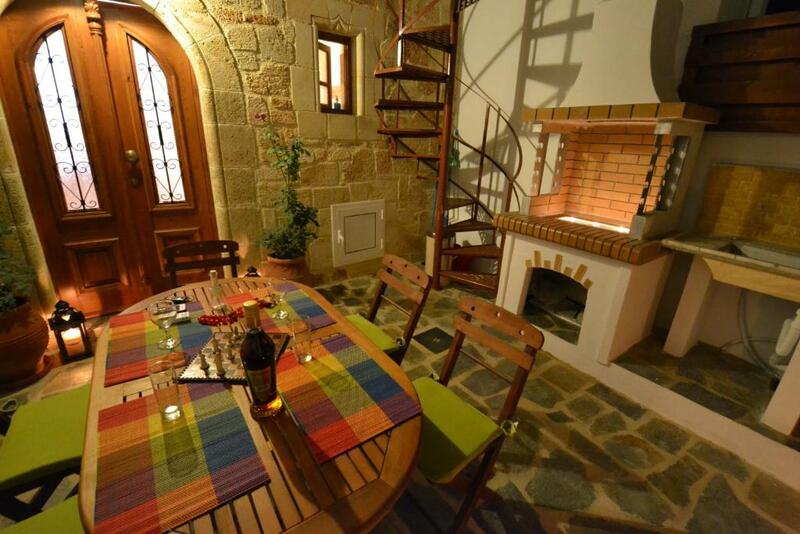 If you want to stay in one of the few genuinely old and traditional houses, this should be your choice! 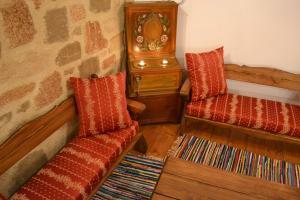 The house is both traditional and equipped with everything that makes your stay convenient. The small yard is a great place to relax and enjoy dinner/ breakfast. There is an additional sleeping bench next to the kitchen area. Archanegelos might not be the most exciting of the towns in Greece/Rhodes, but it is a good base for exploring this part of the island, with some excellent beaches within 10 minute drive. We particularly recommend Stegna, which seems to be least touristy out of all those beaches. Värden var helt underbar i sitt bemötande och hjälpte oss med alla möjliga saker som hjälp m läkarbesök, apotek, val av restaurang... mm. Bara att maila Antonis och han svarade oftast inom ett par minuter. Skönt att ha tillgång till alla bekvämligheter som man har hemma såsom fullt utrustat kök och tvättmaskin och wi-fi. Bra med egen privat parkering då det är hopplöst att få en parkering annars i denna byn. Доступность сразу нескольких разнообразных хороших пляжей (10-20 мин. на автомобиле). Близкое расположение продуктовых магазинов. Удобное расположение для поездок по острову на арендованном автомобиле. Наличие парковочного места (автомобиль необходим обязательно). Наличие внутреннего дворика (совсем небольшой). Колоритное историческое жильё в национальном стиле, свежий ремонт, отзывчивый хозяин. Отличный дом в греческом стиле, есть всё необходимое для отдыха. Хозяева очень радушные! Schönes altes Haus im alten Teil und verwinkelten Teil von Archangelos. Im Dorf ist alles zu Fuß zu erreichen. Die Unterkunft entspricht den Fotos. Als Familie hat man ausreichend Platz und Rückzugsmöglichkeiten. Handtücher und Bettwäsche werden zweimal wöchentlich gewechselt und sind zusätzlich in ausreichender Menge im Haus vorhanden. Ebenso wird zweimal wöchentlich geputzt. Das Dorf Archangelos ist ein guter Ausgangspunkt zum Erkunden der Insel Rhodos, wenn man abseits der Touristenhochburgen wohnen möchte. Archangelos ist vielleicht nicht pittoresk, dafür aber ehrlich griechisch. Es gibt jede Menge Cafés und Restaurants, die auch oder vorwiegend von Einheimischen frequentiert werden. Der Gastgeber ist ständig in E-Mail Kontakt mit den Gästen und fragt, ob noch etwas fehlt etc. Lock in a great price for Patitiri Villa – rated 9.4 by recent guests! 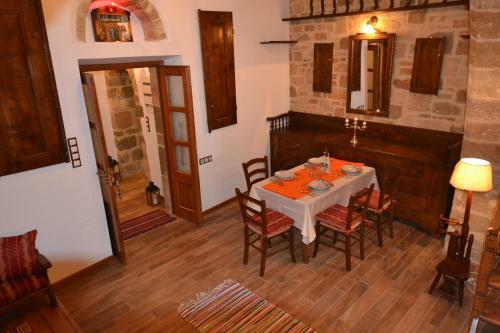 Located in the center of Archangelos, Patitiri Villa offers traditional accommodations with a fully equipped kitchen and an inner, stone-paved courtyard with dining area. The beaches of Tsabika and Stegna are 1.2 mi away. 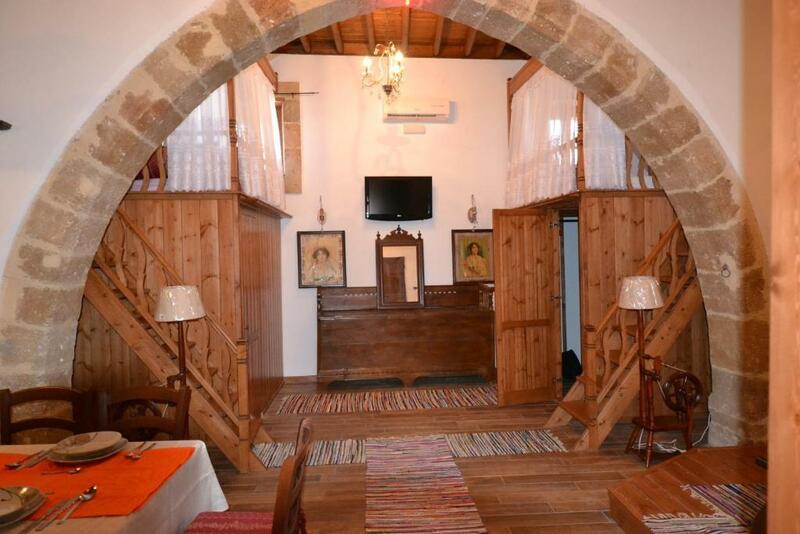 Villa Patitiri features arched walls and wooden furnishings. 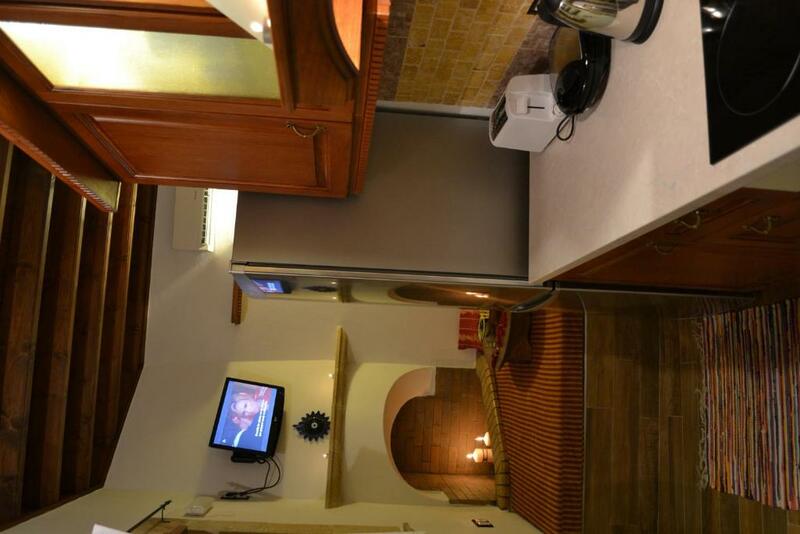 It is equipped with a flat-screen, satellite TV, DVD player, washing machine, and has an private bathroom with hairdryer. Free WiFi is available throughout. The scenic seaside village of Lindos is 9.3 mi away, while the Medieval town of Rhodes is at 19 mi. Free private, on-site parking is provided. 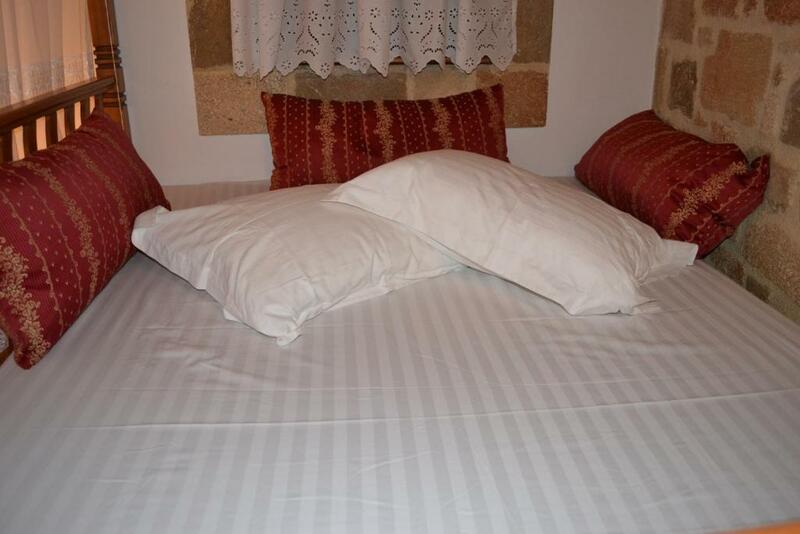 When would you like to stay at Patitiri Villa? Traditionally furnished villa with fully equipped kitchen, inner courtyard with dining area, flat-screen TV and DVD player. Free WiFi is available. 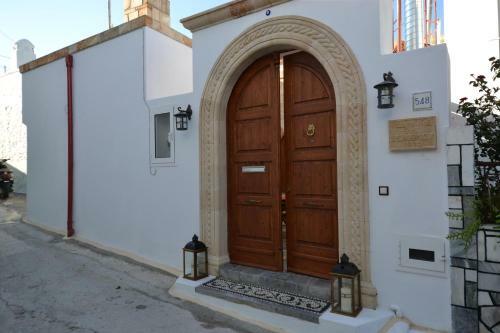 TO PATITIRI VILLA ΕΙΝΑΙ ΕΝΑ ΠΑΡΑΔΟΣΙΑΚΟ ΚΑΤΑΛΥΜΜΑ ΤΟ ΟΠΟΙΟ ΑΝΑΚΑΙΝΙΣΤΗΚΕ ΜΕ ΒΑΣΗ ΤΗΝ ΠΑΡΑΔΟΣΗ ΚΑΙ ΟΛΑ ΤΑ ΧΑΡΑΚΤΗΡΙΣΤΙΚΑ ΣΤΟΙΧΕΙΑ ΤΟΥ ΤΟΤΕ, ΜΕ ΟΛΕΣ ΤΙΣ ΣΥΓΧΡΟΝΕΣ ΑΝΕΣΕΙΣ ΤΟΥ ΣΗΜΕΡΑ. ΕΙΝΑΙ ΠΛΗΡΩΣ ΕΞΟΠΛΙΣΜΕΝΟ ΜΕ ΟΛΑ ΤΑ ΑΠΑΡΑΙΤΗΤΑ ΓΙΑ ΝΑ ΚΑΝΕΙ ΤΙΣ ΔΙΑΚΟΠΕΣ ΣΑΣ ΞΕΧΩΡΙΣΤΕΣ ΜΕΣΑ ΣΕ ΕΝΑ ΦΙΛΙΚΟ ΚΑΙ ΦΙΛΟΞΕΝΟ ΠΕΡΙΒΑΛΛΟΝ, ΣΤΟ ΠΙΟ ΠΑΡΑΔΟΣΙΑΚΟ ΣΗΜΕΙΟΥ ΤΟΥ ΧΩΡΙΟΥ ΚΟΝΤΑ ΣΤΟ ΚΕΝΤΡΟ. Η ΟΙΚΟΓΕΝΕΙΑ ΜΟΥ ΚΑΙ ΕΓΩ ΣΑΣ ΠΕΡΙΜΕΝΟΥΜΕ ΓΙΑ ΝΑ ΣΑΣ ΦΙΛΟΞΕΝΗΣΟΥΜΕ ΣΤΟ ΚΑΤΑΛΥΜΑ ΜΑΣ ΚΑΙ ΝΑ ΣΑΣ ΠΑΡΕΧΟΥΜΕ ΟΠΟΙΑ ΠΛΗΡΟΦΟΡΙΑ ή ΟΤΙ ΑΛΛΟ ΧΡΕΙΑΣΤΗΤΕ ΚΑΤΑ ΤΗΝ ΔΙΑΡΚΕΙΑ ΤΩΝ ΔΙΑΚΟΠΩΝ ΣΑΣ. ΤΟ ΠΑΤΙΤΙΡΙ ΕΙΝΑΙ ΣΤΟ ΚΕΝΤΡΟ ΤΟΥ ΑΡΧΑΓΓΕΛΟΥ ΚΑΙ ΕΙΝΑΙ ΤΟ ΠΙΟ ΠΑΡΑΔΟΣΙΑΚΟ ΣΗΜΕΙΟ ΔΙΠΛΑ ΣΤΗΝ ΕΚΚΛΗΣΙΑ ΤΟΥ ΑΡΧΑΓΓΕΛΟΥ ΜΙΧΑΗΛ. ΓΕΝΙΚΑ ΜΙΑ ΗΣΥΧΗ ΠΕΡΙΟΧΗ ΓΙΑ ΚΟΝΤΙΝΕΣ ΒΟΛΤΕΣ ΜΕ ΤΑ ΠΟΔΙΑ ΣΤΟ ΚΑΣΤΡΟ ΚΑΙ ΣΤΑ ΣΤΕΝΑ ΔΡΟΜΑΚΙΑ ΤΟΥ ΑΡΧΑΓΓΕΛΟΥ. 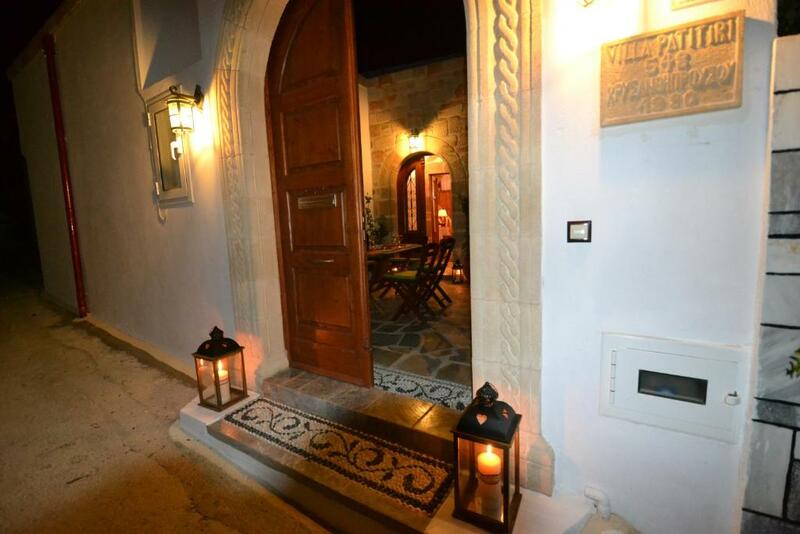 House Rules Patitiri Villa takes special requests – add in the next step! Patitiri Villa accepts these cards and reserves the right to temporarily hold an amount prior to arrival. Please inform Patitiri Villa of your expected arrival time in advance. You can use the Special Requests box when booking, or contact the property directly using the contact details in your confirmation. We arrived around 10pm, due to a delayed flight, and could not find the property on our own with sat nav. However when we phoned the owner he sent his brother to meet us and lead us through the narrow streets to the property. The allocated parking space was being used by someone else but we were able to find another space nearby. The unreasonably small furniture in the living room... Parking wasn't designated as stated in the booking although we parked nearby and it was okay.